Stylish exterior: The facade of the CX-9 has remained unchanged. MAZDA Australia reckons it has the wood on its mainstream rivals for interior quality and now it has the inlays to prove it. 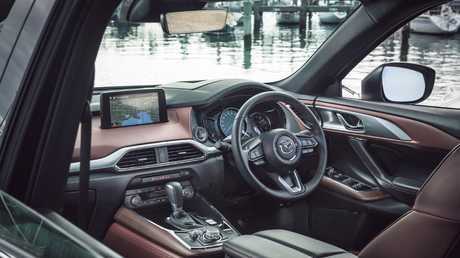 The launch of the updated CX-9 includes a new premium variant, the Azami LE, with timber panels in the centre console and doors. It's not so much challenging prestige bands as giving existing and prospective buyers of the flagship SUV little reason to consider them. 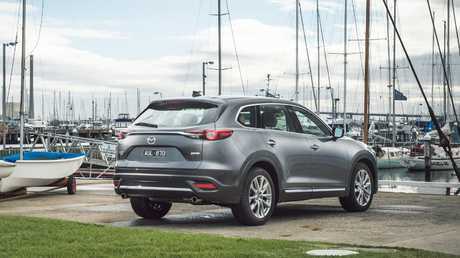 The latest version of the seven-seater launched in 2016 and still looks sharp, so Mazda has devoted the budget to improving the ride, quietening the already hushed interior and adding to the standard equipment. CX-9 designer Shinichi Isayama says the Azami LE's interior is intended to highlight handmade craftsmanship rather than mass-production processes. 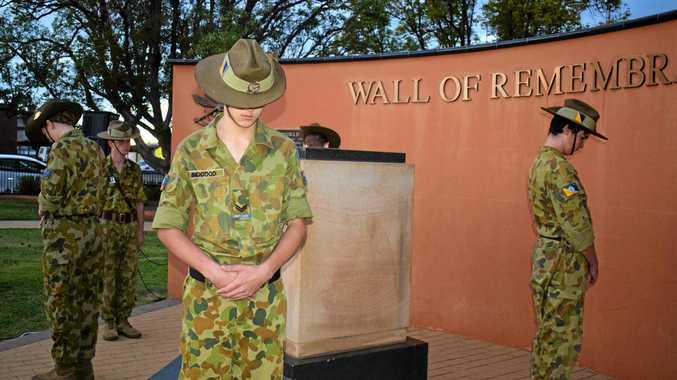 "We were particular about using authentic materials. The idea was to create a relaxing, elegant space that looks premium," he says. The default kit now includes autonomous emergency braking up to 80km/h, blind spot monitoring, lane keep assist, auto-folding side mirrors, adaptive cruise control and rear cross traffic alert. All versions have traffic sign recognition, head-up display projected on to the windscreen and, for the first time in a Mazda SUV, Android Auto/Apple CarPlay connectivity. The five-grade line-up starts at $44,990 plus on-road costs for the Sport with auto wipers and LED headlamps, seven-inch infotainment touchscreen and black cloth upholstery. Spend $51,390 for the Touring and the kit expands to an eight-inch screen, leather upholstery, powered and heated front seats, keyless entry, second-row centre armrest and USB ports. Sharp steering: The updated CX-9 has more responsive steering. The GT then adds 20-inch wheels, sunroof, heated second-row seats and 12-speaker Bose audio for $59,390. The Azami starts at $60,990 with headlamps that turn with the wheels, surround-view camera, seven-inch LCD digital driver's display, heated steering wheel and ventilated front pews. All-wheel drive adds $4000 to all versions. Finally the AWD-only Azami LE packs that timber trim, brown Nappa leather, bespoke overhead console and ambient lighting in the centre console for $66,490. Mazda conservatively expects 6500 sales in the next 12 months. Of those, the Azami is predicted to account for about 30 per cent, closely followed by the GT at 27 per cent. About 57 per cent of buyers will choose the cheaper, generally smarter front-drive option. 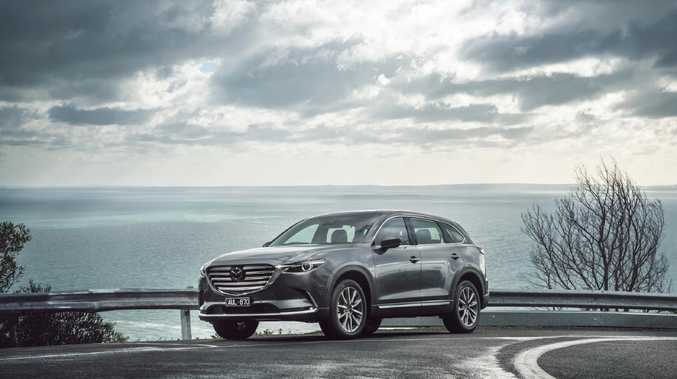 Premium feel: Mazda’a new flagship CX-9 is challenging premium brands. Extra equipment and sound deadening adds about 25kg across the range, with kerb weight varying from 1878kg-2000kg. Despite this, the 2.5-litre turbo still claims 8.4L/100km for front-drivers and 8.8L for AWD versions. The tow rating is unchanged at 2000kg but the ball weight has improved from 100kg to 150kg. Revised rebound rates for the dampers can't stop the Azami's 20-inch rims from riding firmly over road ripples. 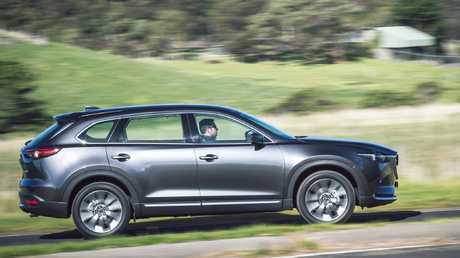 The CX-9 atones for the low-speed patter by not having the sidewall distort and cause body roll and jiggling under the near two-tonne weight when loaded up through sweeping corners. For those who don't want that level of driving dynamics, opt for the Sport or Touring versions on more comfortable 18-inch rubber. Insulated: Mazda has added more sound deadening material to reduce road noise. 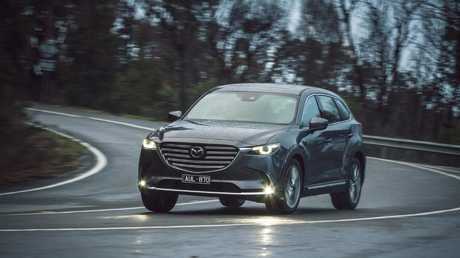 Disable the lane keep assist and point the big Mazda at some typical Tasmanian back roads and it tracks true regardless of the corner radius and road surface. On tight turns, you can just feel the Mazda's tricky software pull it towards the apex if momentum threatens to carry the SUV straight on. The steering feels marginally more responsive and has decent feedback for a car this size. A momentary lightness to the wheel on hard corner exits hints at the turbo's power before the AWD shuffles grunt to the rear wheels and you dart out of the corner. In terms of its on-road handling, the CX-9 still feels like the best behaved seven-seater you can buy for less than $70,000. The head-up display shows the prevailing speed limit, as read by the traffic sign recognition camera, along with your rate of progress and, if you're using the satnav, the direction and distance to the next turn. Family-hauler: The seven-seat SUV is a polished product. Added safety and features reinforce the CX-9's strong credentials. There are cheaper seven-seat SUVs out there but none with this level of polish and precision.